New for 2009 I've decided to make the world's smallest one man band. But size isn't everything! This miniorchestra has everything. 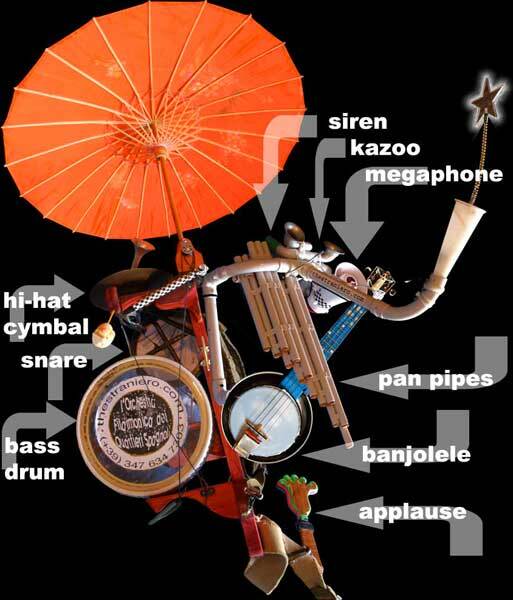 Mini-bass drum, fully working hi-hat cymbal, mini-snare, siren, kazoo, a chromatic pan pipe, harmonica and a mini megaphone for the voice and harmonica. I play it with my banjolele. I'm really enjoying the pan pipes! They add a whole other dimension to the music. It's like having an organ that you can play without any hands. The whole thing only weighs about 5 or 6 kilos! It's not as loud as Radio Gualgione, but it's a heck of a lot easier to take out for everyday busking or walking shows! I hope to make some recordings soon!